Citation Information: J Clin Invest. 2017;127(4):1146-1154. https://doi.org/10.1172/JCI88887. The vitamin D receptor (VDR) is the single known regulatory mediator of hormonal 1,25-dihydroxyvitamin D3 [1,25(OH)2D3] in higher vertebrates. It acts in the nucleus of vitamin D target cells to regulate the expression of genes whose products control diverse, cell type–specific biological functions that include mineral homeostasis. In this Review we describe progress that has been made in defining new cellular sites of action of this receptor, the mechanisms through which this mediator controls the expression of genes, the biology that ensues, and the translational impact of this receptor on human health and disease. We conclude with a brief discussion of what comes next in understanding vitamin D biology and the mechanisms that underlie its actions. 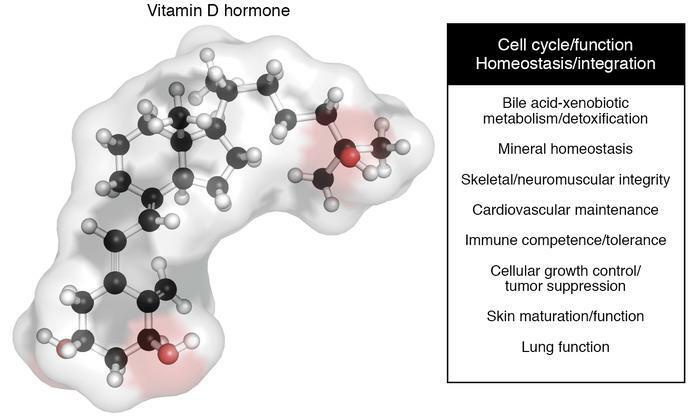 Biological roles of the vitamin D hormone. The three-dimensional structure of the vitamin D hormone is shown, with several of the major biological activities indicated.